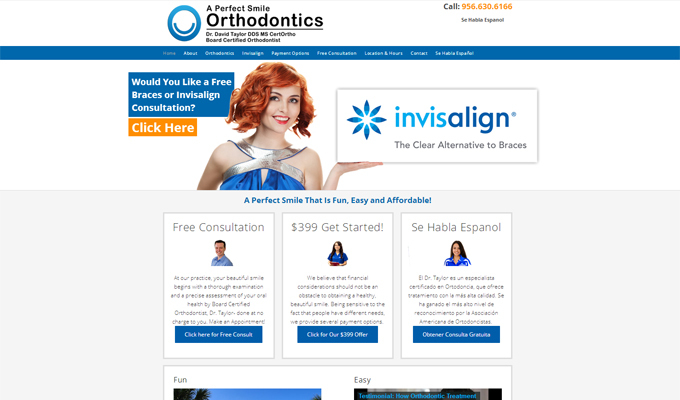 I just completed a fresh website for a McAllen orthodontist and used a fully mobile responsive framework. The result has been an immediate surge in conversion rate. This is not unexpected because visitors to this site are running at 55% visits on mobile devices which mea.ns that mobile users are a dominant factor in this particular orthodontist marketing strategy. Bringing a better mobile experience to website visitors has had an immediate impact on inquiries and has been very valuable. While this website was running a mobile version previously, it did not have the same visual impact and ease of navigation that the new fully mobile responsive site has. Orthodontist marketing is very much new customer driven with little repeat business. Because of this orthodontists need to caepture as many of their website visitors as possible. It also seems likely that the mobile percentage is driven by the specific demographics of an area. For example a dental website I am running San Antonio is getting 40% of it’s visitors over mobile, a considerable difference. From what I have seen, call to action is very important on orthodontist websites and dental websites in general. Good eye trail and a clear and compelling call to action make a big difference in the number of inquiries. This is especially important where the orthodontist or dentist is also using paid advertising to drive traffic to the website. Paid orthodontist marketing is very competitive and if the visitor arriving is not immediately engaged, then they are going to bounce to the next provider. “Free consultation” or some other simple call to action makes a big difference in the results from paid marketing. Pay Per Click Ads (PPC) are also very significantly mobile driven. This website is getting 45% of all its paid visitors through mobile. So once again, strong presentation to mobile visitors has a significant impact on your return in investment for your paid advertising.